My two golden fur kids just got through with a rousing round of bitey face, so I thought I would take the time to introduce them to you. This is Lucy. She is a golden retriever and I have had her since she was 10 weeks old. She was the last puppy left in the litter and she was just the right one for me. She is super smart and if I hadn't quit taking her to classes, she could be an obedience champion. I had hopes of doing therapy work with her, but when I took a job at district office 6 years ago, my free time to train with her went kaput. Lucy is sweet and smart and the boss of the 2 goldens. This is Desi. She came to me at age almost 3, a rescue of sorts. The trainer where Lucy and I were taking classes asked me one day if I knew of anyone who was looking for a golden. Seems her owner dropped her off for boarding and never picked her up. She had been there in a kennel for almost 9 months while the facility went to court to get legal rights to adopt her out. I had been thinking about getting a companion for Lucy (I am too old to have a puppy and she proved it!) but said no when I saw she had hip issues. (Hip dysplasia is a problem in golden retrievers.) An older couple took her but brought her back because she jumped and wouldn't stay outside. I got a call saying she was available and I leaped at taking her. It was just meant to be. Desi is not the brightest crayon in the box, but she is loving and loyal. She has some separation anxiety - she hates it when we leave and will lay down in front of the door in hopes that we won't go. She also goes in my bedroom if she thinks I am leaving and refuses to come out (we keep the bedroom doors closed when we leave; they are the only rooms with carpet). She also has severe thunderstorm anxiety, so the Thundershirt and melatonin come out when when it storms. Then there's Hannah. 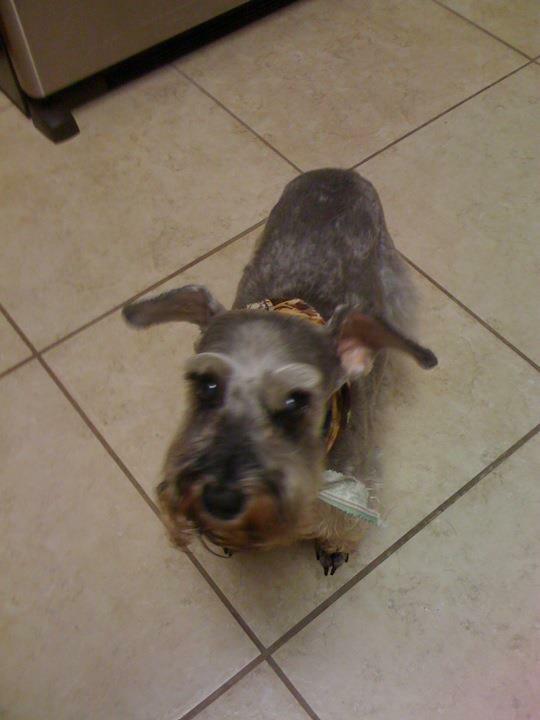 Hannah was my mother's miniature schnauzer. When Mom passed away almost 3 years ago, I got custody of Hannah. She is almost 15 and is a brat. She barks at everything. She is jealous of Lucy and tries to boss her around. Lucy just wants to play with her, but Hannah rarely wants any part of that. She has an elaborate medication schedule due to being allergic to the world, having a history of bladder stones, and high triglycerides. However, my mother loved her and my roommate loves her now, so she gets to stay. It's never dull, having 3 dogs around the house. The critters have it good here at Kasa Krazy, but I wouldn't have it any other way. AHHHHHH, the girls. They are all sweet girls. Your second Golden looks just like my Colby! I can see why you are attached to all three. Thanks for sharing them with us.